How to find us and where to park. You're always welcome to come and say hi! 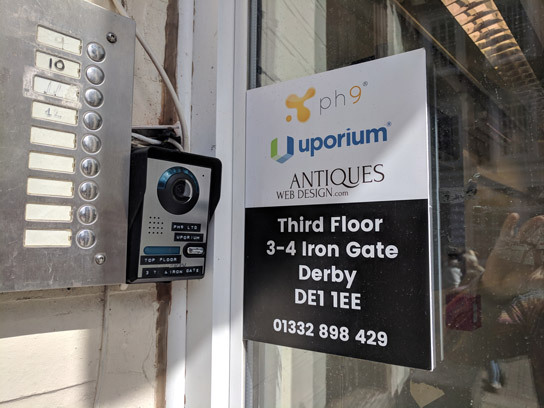 We’re in the city centre of Derby, just down the road from the Cathedral in the heart of the Cathedral Quarter. Derby is pretty central, and close to many of the road networks. 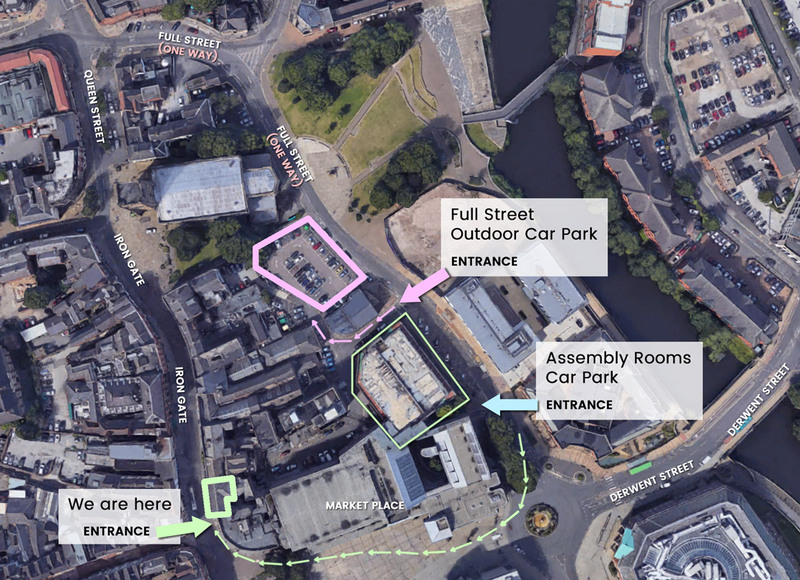 From the Full Street car parks, walk through the marketplace, and turn right onto Iron Gate, as per the arrows on the above map. The marketplace is a large open area, although sometimes may have tents with events running in it. You’ll know you’re in the market place when you see the Assembly Rooms and Ask Italian on your right, and the Quad on your left. 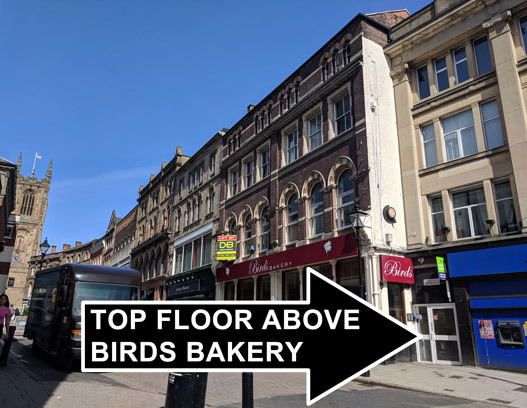 Where we are - We’re on the top floor above the Birds Bakery on Iron Gate. What we’re next to - It’s next to Nandos and Betfred (to the right), and George Brigdens (to the left). 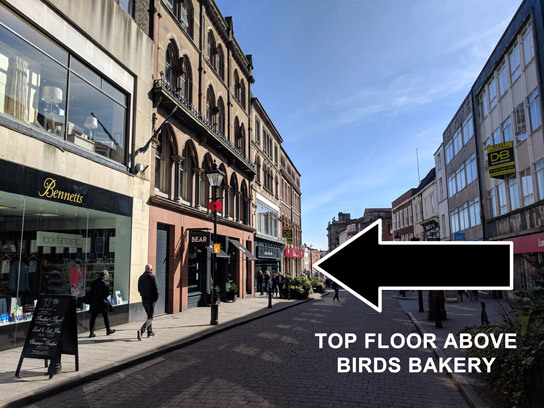 We’re opposite - Lloyds Bank, Jorrocks Bar and Foulds Music. 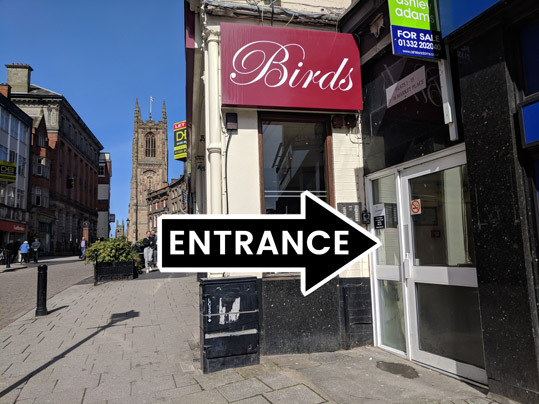 Our entrance - Is to the right of Birds (see pics below). You’ll see we have an intercom by the door. Please ring when outside so we can let you in or come downstairs and meet you.